My first new acquisitions happened just after returning from Quebec. I found a good deal on a barely used Sage TCX 7126, more commonly known as the "Death Star." I pared it with a new Danielsson L5W 8twelve reel, a couple Beulah Elixir V2 Scandi heads, and a Rio GripShooter running line (more on the lines below). It would be unfair of me to review the rod and the reel at this time. Aside from a little casting practice, I've barely used either. I'll wait, catch some fish on it next spring and summer, then write a more thorough review next year. I wish I had thought to buy it before the Quebec trip. I'll have to take it up with me in June 2015. My next purchase was a new (used) reel for my Sage Graphite II 9' 7wt. I got a great deal on an Islander LX 3.6. One of the first salmon I ever hooked was on my guide's G. Loomis/Islander combo. I remember liking the reel, but it was a while ago and I don't remember much more than a general impression of its performance. This deal was too good to pass up, so I decided to roll the dice. I'm glad I did. I LOVE this reel! It's a little heavy, but not heavy enough to be a burden. My old Sage rod is heavier than a new rod, so it balances ok. The Islander's Teflon and graphite-impregnated cork drag is buttery smooth and has a huge range of adjustment. I really like the feel of the handle. This reel is a real pleasure to fish with. I have my eyes peeled for another, larger, Islander LX (whether I need it or not). I purchased another previously owned reel shortly after buying the Islander. Though my new Danielsson hasn't seen any action yet, I am already a big fan. A new friend gave me a good deal on his old, Loop-era, Danielsson LW 6nine. I figure it's about ten years old, but works like it was brand new. This reel went on my trusty Sage 6110 switch rod. It's a little light for that rod, but wasn't too bad. It got less action than the Islander and didn't fight as hot of fish, but I was still very impressed. The drag is just as smooth as the Islander, though not quite as "buttery" feeling. I can't explain it exactly...you just have to trust my choice of words on it! What the Danielsson reel loses in feel, it more than makes up for in dependability. The sealed drag seems impervious to dunking, cold temperatures, etc. I definitely have more faith in the Danielsson late in the season than the Islander. I own both, so I guess I don't have to decide between the two if I don't want to! I really do like both reels. I'm constantly scouring the internet for good deals. Plenty of used Islanders come up on eBay. However, when I found out Danielsson is only selling direct to consumers now, and also having a holiday sale, I pulled the trigger on a new L5W 6nine. The new one is a little different from the older one I bought used. It's the little brother to the reel I am using on the Death Star. The new reel is a little heavier than the old reel and holds more backing. Also, I think the drag on the new reel has a wider range than does the old one. I am going to use the new Danielsson on the aforementioned Sage switch rod and move the older one over to my main salmon single hander, a Vision GT Four 9' 8wt. When I first starting using a trout-sized switch rod a couple of years ago, I made the decision to use a monofilament running line (Rio SlickShooter). I liked the performance of the mono more than I thought I would. This season, I decided to switch all my running lines over to mono. The first running line I tried was Berkley Big Game in 30# test. At first, I bought the wrong color. I bought Green, which became virtually invisible in the water. I bought another spool, this time in Solar Collector (a fluorescent/hi-vis green). I can't really find much bad to say about the stuff. It shoots like crazy, has minimal memory once stretched and fished, and it's cheap. Like, really cheap. 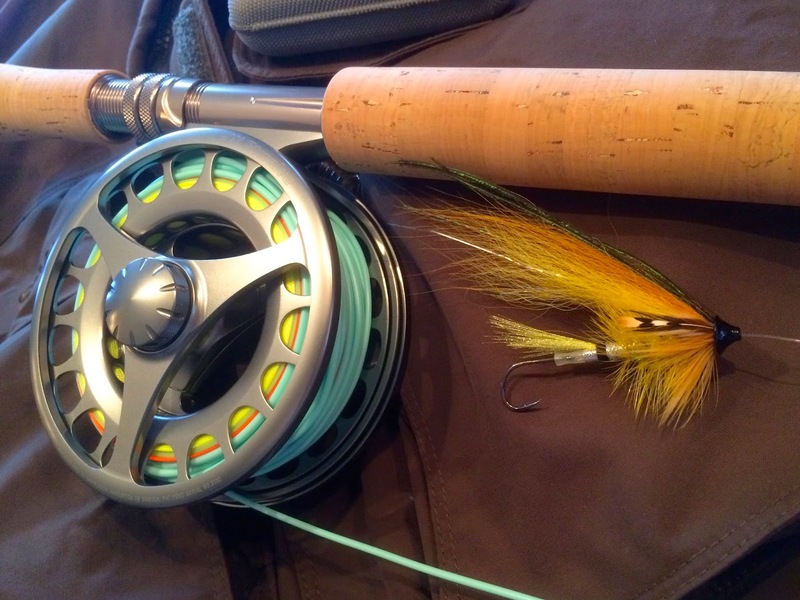 It's nice to avoid paying the "fly fishing tax" every now and then. I saw this post about using rubber tape to reduce mono slippage. The Temflex 2155 rubber splicing tape works like a charm! Rio decided to go a different route when it came to getting a good grip on slippery monofilament running lines. The Rio GripShooter has a coated front section that feels like fly line. It is a pleasure to use, though much more expensive than Berkley Big Game. I've only tried it a few times, but so far I really like the GripShooter. I figure I'll use it for a while and see how it holds up. If the coated section is durable enough, I'd consider purchasing it for other setups. Not being one who can pass up a good deal, I bought several Beulah Elixir V2 heads at reduced Sierra Trading Post prices. I think the heads have some sort of cosmetic imperfection, but I have yet to find any. I bought heads for two different switch rods and two heads for the Death Star. I liked the original Elixir. The fine front taper makes it a great head for surface presentations. I prefer other heads when using sinking polyleaders, however. The Elixir V2 seems to turn over better for me than the original. The taper is still pretty fine, so I continue to use it mainly for intermediate-to-floating polyleader applications. I especially like the Elixirs made for switch rods. No complaints so far! I have only one item to review in this category, but it's an item I really enjoy using. The Omnispool Switchbox is one of those little inventions that just makes our lives that much easier. I never really minded moving fly lines between spools and reels, but the Switchbox kit makes it so much easier. It really doesn't get much easier. In fact, I'm starting to wonder how I lived without this before. It couldn't be any easier to switch a line alone and virtually anywhere...at home, on the riverbank, in a boat, etc. It's a piece of cake. It's so much easier, it's almost a pleasant task. The kit costs between $20-$25, which seems sort of pricey for plastic parts, but it's worth every penny. I'm actually less inclined to buy spare spools for my reels now that I can switch lines with so little hassle. I'm not going to explain how it works. Go to their site and watch a video. 'Nuff said! Next week, I'll be reviewing some packs and clothing. Check back!